This week the Centre for Research Collections has been closed for its annual stock check. We’ve taken the opportunity to review the locations of our key items and our accessions of the last few years, as well as carry out some essential housekeeping work to make sure our stores are clean and the contents accessible. We’ve also worked together to re-house architectural plans, photographs and glass plate negatives, update information in collections databases, install and label new shelving, and transfer outsize items to locations where they can be more easily removed and replaced. It’s been a productive week but there’s still lots to do in next year’s stock check! On Wednesday, staff from the Royal College of Surgeons of Edinburgh (RCSEd) Library and Special Collections visited for a tour of LHSA facilities in Edinburgh University Library (EUL). Laura and Ruth gave them a tour of the reading room, conservation studio, office space and store rooms. 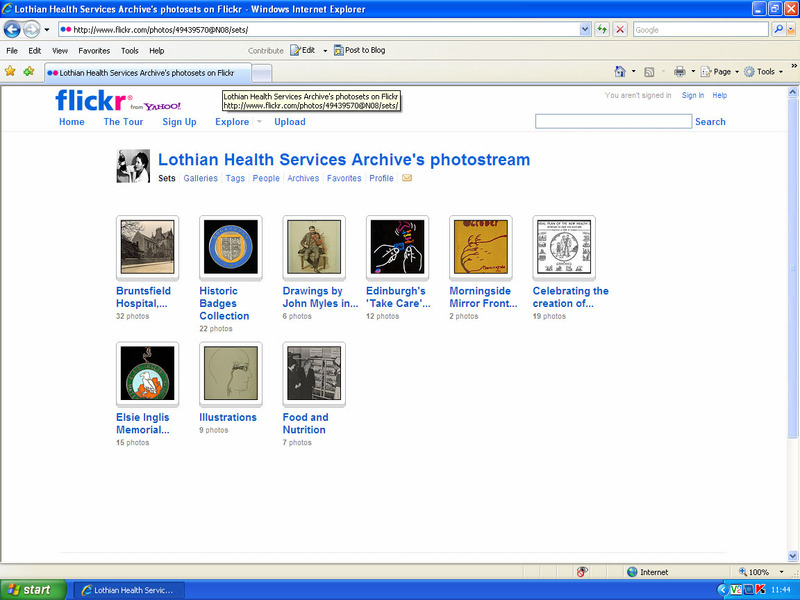 A number of treasured and representative items from LHSA’s collection were displayed to them, including the 1807 charter of the Royal Edinburgh Hospital, photographs of royal visits, and promotional material from the HIV/AIDS collections which were recently added to the UNESCO UK Memory of the World Register. Laura explained how LHSA receives new material and responds to enquiries whilst Ruth described how the conservation requirements of the records are met and the ways in which LHSA collaborates with other departments within the Centre for Research Collections at EUL. The photo shows Marianne, College Librarian, and Steven, Assistant Librarian, being shown collection items in the Viewing Room by Ruth and Laura. This tour was a reciprocal visit, following on from the LHSA staff tour of the RCSEd Library, which took place on 8th April this year. Such professional visits are invaluable for building up links between different organisations and sharing information and ideas. 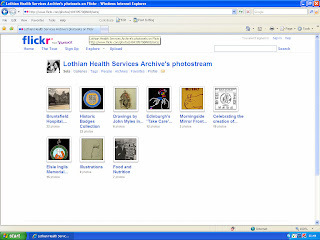 On Monday (13 June), LHSA’s work with Flickr, Facebook and, more importantly, our blog, will be showcased at the Archive and Records Association conference ‘Engage, Share, Participate: Widening Learning and Access to Archives through Social Media’. We have written a short presentation describing our first forays into Web 2.0 and social media, where we have had success in raising our profile, and the lessons we have learnt along the way. There will also be presentations from the Royal Commission on the Ancient and Historical Monuments of Scotland, Perth and Kinross Council Archives, West Yorkshire Archives, the Victoria and Albert Museum and The National Archives. We’re really looking forward to the opportunity to talk about this work with colleagues in the wider profession, and hope to come back with lots of new ideas. As you would expect from a conference all about social media, you will be able to follow it on Twitter @EngageShare #afelg. This week, our Assistant Archivist Laura gave a talk at the meeting of De Partu, a history of childbirth group affiliated with the UK Centre for the History of Nursing and Midwifery. The event celebrated the launch of the book ‘Midwifery in Scotland: A History’ by Lindsay Reid and the talk complemented this with an overview of the types of midwifery records held in the Archive and how they can be used in research. The Archive has c.105 linear metres of midwifery-related material from a wide range of sources including Edinburgh’s maternity hospitals, the Department of Public Health, and the Centre for Reproductive Biology at the University of Edinburgh. They contain annual reports and minutes, birth registers and casebooks, staff registers, publications going back to the 1750s, press cuttings, photographs and objects to name a few. 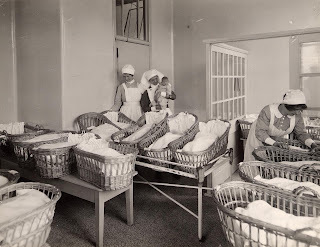 The records are widely used in research: statistics on the birth weight of babies born between 1841 and1921 have been collated and used in a longitudinal birth weight study; social historians have used information recorded in the birth records to build up a picture of the occupations and social class of the mothers using particular hospitals; and Helen Millar Lowe’s personal papers have been used to chart the campaign to keep only female staff at Bruntsfield and Elsie Inglis Hospitals. The records are a fantastic resource and we hope that new research possibilities can be explored by opening them up to wider audiences.